What started as a novelty has grown into so much more. If you have no idea what I'm talking about, well 1) you need to start getting your hind-parts to the World of Beer Arlington at 7pm on Wednesday nights, and 2) allow me to introduce you to the wonder and lore of the legend that is, Robocop. Years ago when I first began hosting live trivia in the DFW area, I had a team of regulars that each week, when completely puzzled by a question, would supply Robocop as their answer in some form. It sounds innocent enough, but as the nights and weeks went on, other teams started to join in on the fun. I know you're probably reading this thinking, "It's Robocop. It's not that funny. That movie sucked!" Well, you'd be correct, but only partially. When asking questions about the largest city in Croatia and the supplied answer is Robocopburg, it sounds silly at first. Then, when asked what former slave was the chief architect behind the Underground Railroad, and Robocop is the guess, you chuckle a little more. You can see where this tends to have a snowball effect. The more random and ludicrous the question, the better a fit for Robocop. For instance, did you know that the speed required to break the sound barrier is actually 34.187 Robocop poots. So, as we move further toward trivia mecca, let us not forget one of our most random yet ingenious default answers, Robocop. Try it out for yourself the next time you're team is stuck on a question and in need of a quick answer. Unlike the movie, Robocop will not let you down. On to trivia! In game 1, we witnessed the triumphant return of the Deadwrinkle as they edged out 4 other teams which all tied for second. With a clear need to determine a second place winner, and more importantly, some prizes to hand out, we had to move into a tie-breaker. In the tie-breaker, team Drank edged out Dave's Angels, My Couch Pulls Out, But I Don't, and Quiz in My Pants. The Power Hour of PubGuys Trivia saw My Couch Pulls Out, But I Don't win going away, while Dave's Angels just squeaked by Deadwrinkle for second place. Timbaland scored a #2 Billboard hit with "Goodbye, Yellow Brick Road"
We hope the night was as fun and educational for you as it clearly was for us. 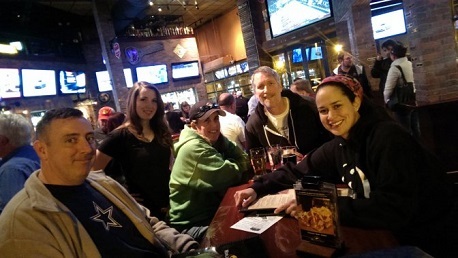 Don't forget to register your team on PGTrivia.com for a chance at some bonus points. We'll see you next week.